Real Estate Agents Take the Risks of Potential Fraud Out of the Earnest Money Transaction. Is Driving Earnest Money Driving You Crazy? the Worst Part of a Real Estate Transaction. In the short time it takes to post an Instagram, you’ve deposited a check and opened the order. Early adopters of ZOCCAM have an advantage in attracting and retaining customers. as well as quicker availability of funds for an overall improved customer experience. 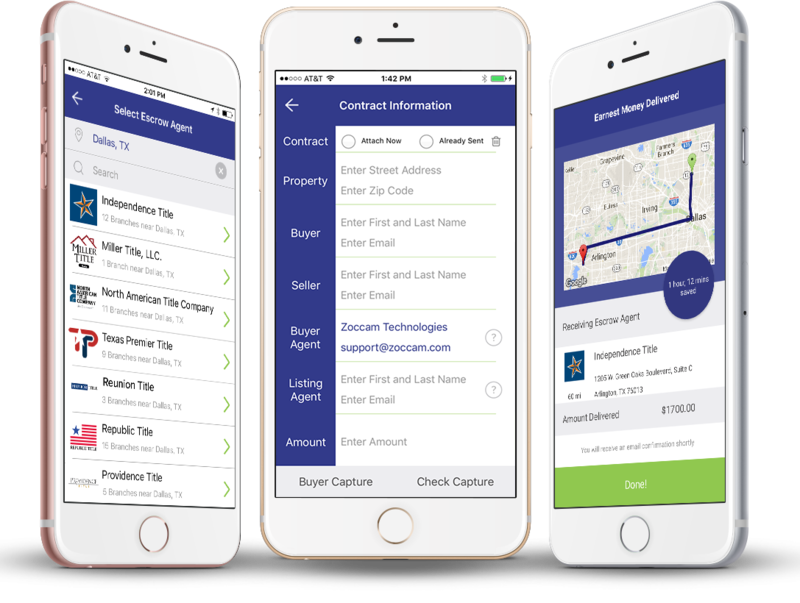 Realtor goes to App Store and downloads ZOCCAM. Realtor registers, using their license number. Select send Earnest Money and completes contract information. Realtor selects “Send Earnest Money” and selects Escrow Agent. Click “Check Capture” and snap front and back of check. We’re happy to help. Reach out to us today so we can show you how to reduce your transaction time and risk while increasing security.